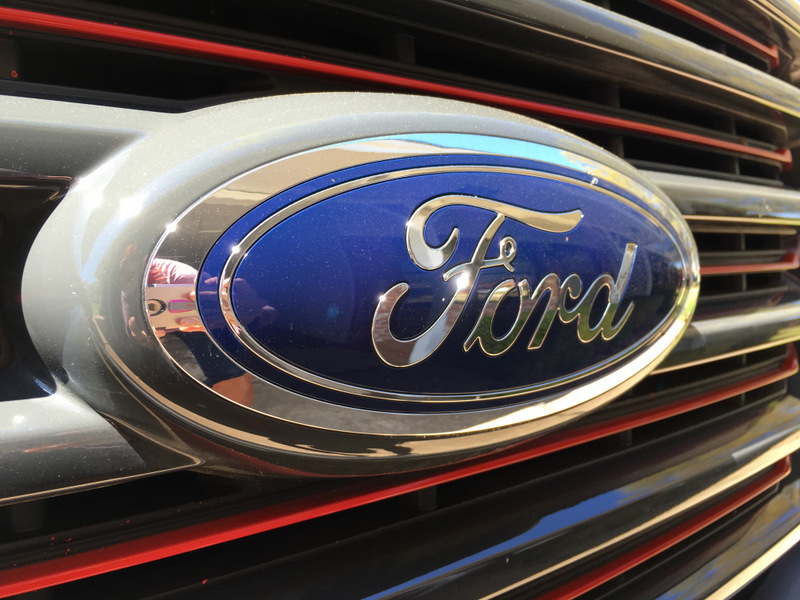 The new 2016 Ford F-150 Lariat is my new dream truck. I drove the 2015 King Ranch last year and was really impressed with it, but it wasn’t the truck for me. It was a little too polished if you will. I’ve said before that I’d found my truck, or the perfect truck, or some other high praise for a pickup. It could be that I don’t currently own a truck and I really want a truck so I’m easily impressed. Or, maybe a lot of trucks are really great and they’ve just been getting better and better. The thing I’ve come to learn about myself and trucks is I like the sportier versions. I want that deep rumble when the engine turns over, or I step on the accelerator. I want to feel the road and the grip of the tires under me. A truck should feel like a truck, not a luxury sedan. When I drove the Tundra from Toyota I fell in love the sound and the way it handled the road. No other truck we’d driven up to that point had impressed me the same. Then the F-150 Lariat came and blew me away. And when I found out I was the first media person in the state of Texas to drive this truck, I felt even more spoiled! You’ve never seen a truck like this. I feel like Ford’s truck design team went down to the Mustang design team, and stole some of their style sheets for this truck. 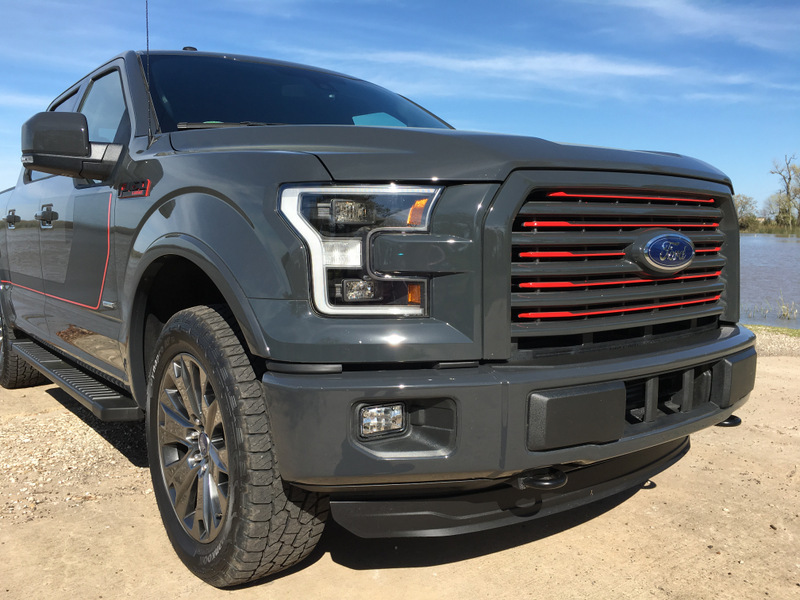 While you can get it in a solid color package, nothing impresses like the Lariat Special Edition Package in Lithium Gray with it’s darker gray, black, and red accents. The bold textured detailing on this truck is perfection and the bright red is placed just-so that you don’t think about it. When I showed this truck off on Periscope the comments were all “WOW!” and “Beautiful!” It’s true; the devil is in the details. Then you hop inside and you find the red in all the right places. 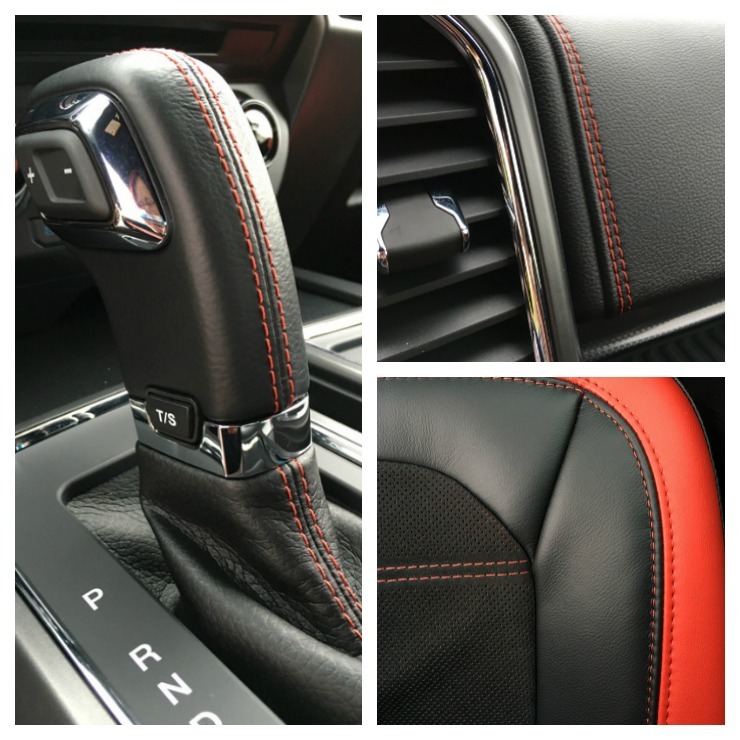 The stitching is my favorite, then the bold red edging on the seats. My my. 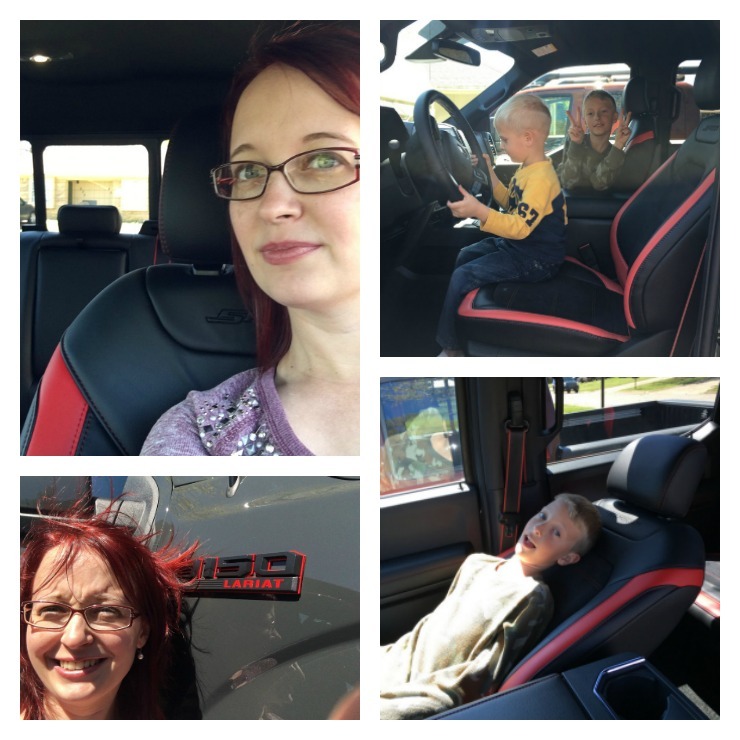 As you can see, I couldn’t get over how well this truck matches my hair, or how much fun my kids had in this truck. Ford trucks are known for being work horses and this one lives up to its name. 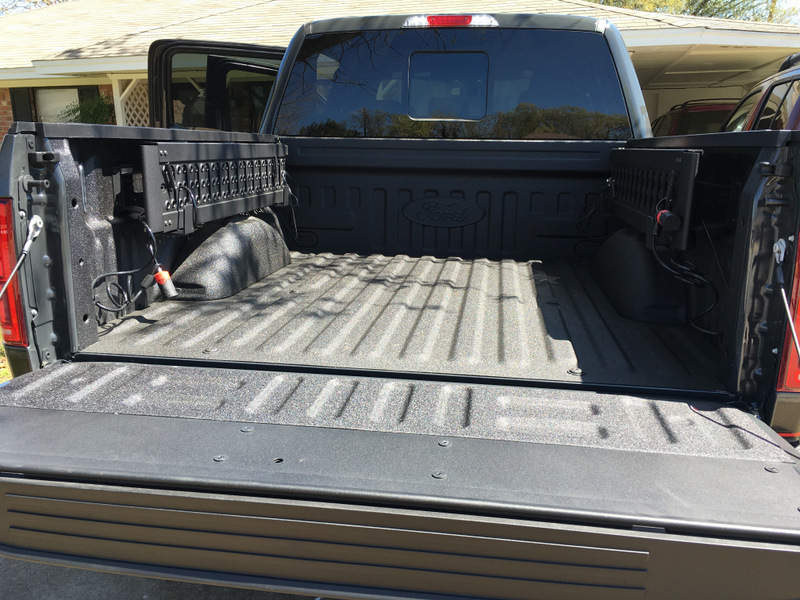 I was especially impressed by the optional spray in bed liner and the stowable ramps which store on the insides of the bed walls and can be used to load an ATV, mower, or other small vehicle. I also feel like the titanium gray color lends itself really well to a work truck. The fully boxed steel frame is something Ford added this year to bring more stability and strength to the F-150. You also have the tow hooks and fabulous fog lamps which come standard and add to the tough look and real-life functionality of this truck. And big mirrors. 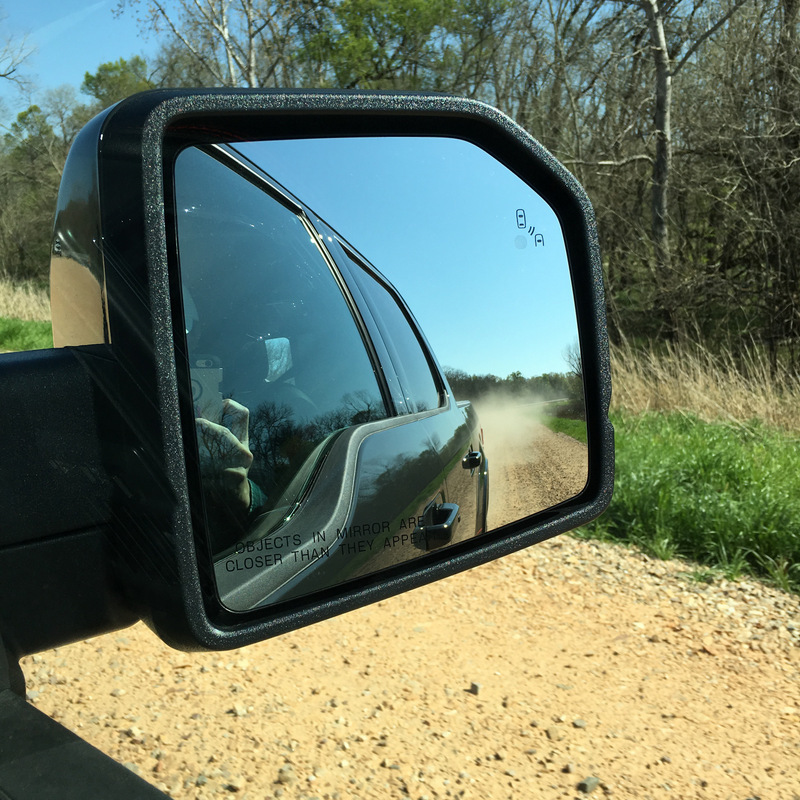 We can’t forget what a difference it makes to have these oversized mirrors when you’re trying to navigate in a truck this big! The 4 wheel drive came in handy when I took the truck to the lake and found a mud hole to play in. It didn’t look deep or terribly slippery, but I was wrong and I needed that low setting on the 4WD to get me out of the mess. It worked so nicely I was tempted to find a bigger mud hole. But I didn’t. We spend a lot of time in our vehicles, so even if we were looking at a truck for work purposes, we’d want something comfortable enough for road trips. In the old days, trucks weren’t known for comfortable rides, but they’re quickly putting luxury sedans to shame! 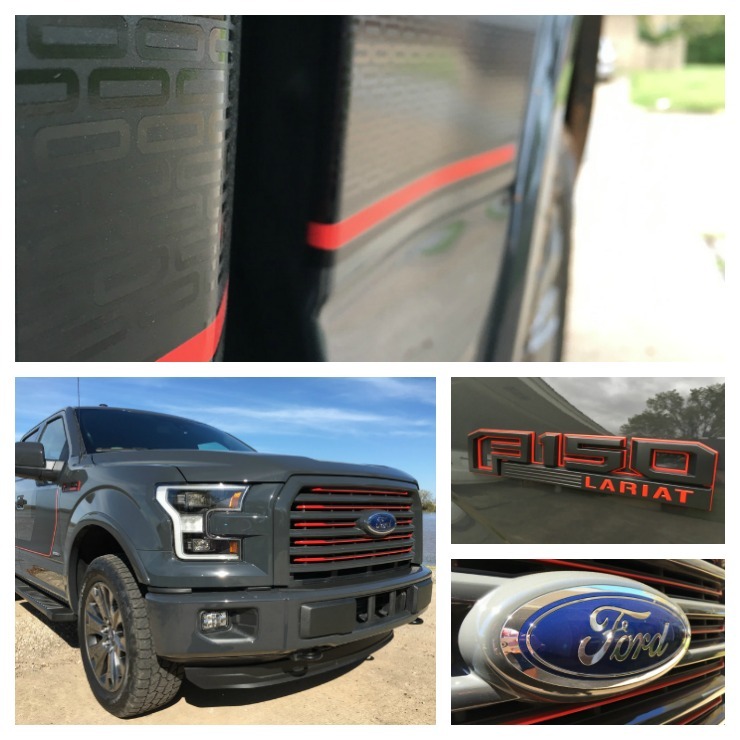 The F-150 Lariat’s Sport Appearance Package is what brings you all the color and beautiful details on this truck. 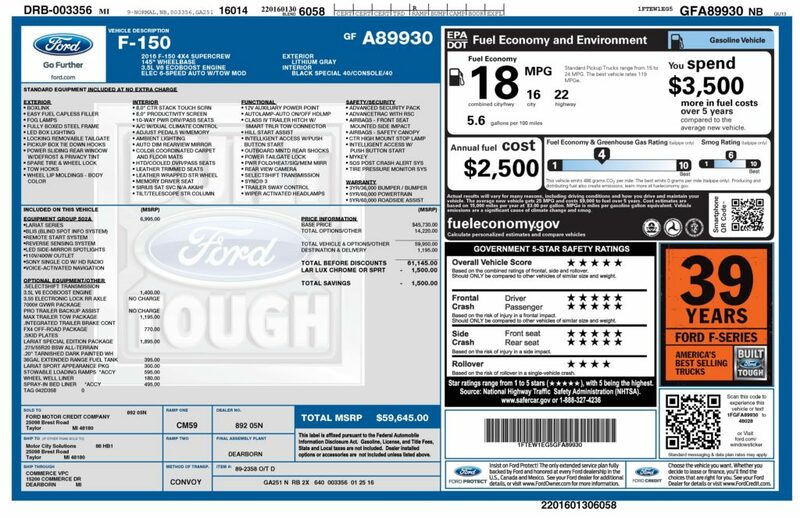 Like any 2016 F-150 you’re going to get a comfortable ride in the moulded seats and you’re going to enjoy the luxury of all the latest technology, but this package is extra special. 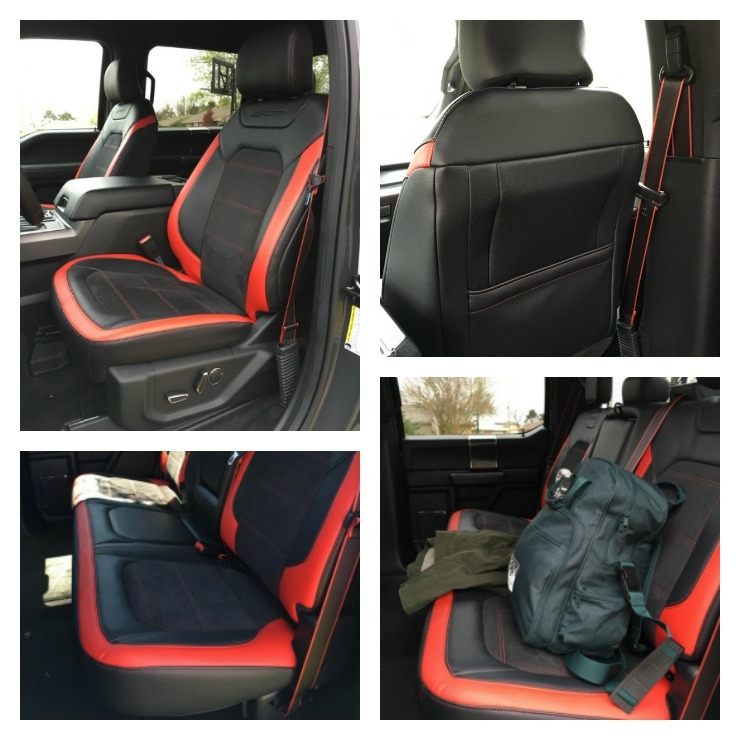 The seat covers are a blend of at least three different materials and each one is buttery soft. They feel rich without looking like they’re fragile and I liked that a lot. I want a truck I’ll feel comfortable using every day and this one made me feel right at home in my blue jeans and muddy boots. And when I took it to the car wash to clean up my mess, all the dried mud vacuumed right up and the truck looked like new again. Now, if you’re a trailering girl (or guy) you’re going to super-love the Pro Trailer Backup Assist™ which allows you to rotate a knob left or right in the direction you want the trailer to go, making backing up way more intuitive. I really wish my in-law’s trailer had been ready for a hook-up because I wanted to try this out! I’ve seen videos, but never got to try it myself. Perhaps I’ll get the chance at the Texas Truck Rodeo this fall. I’m also looking forward to trying the Dynamic Hitch Assist which provides a line-of-sight guide to help direct your hitch ball to the trailer receiver… no more need for a second person standing by the trailer, directing your backing up! The fully flat load space in the back seat area is AWESOME. I am always impressed these days with how much cargo space full size trucks have. 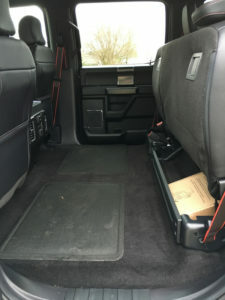 And, Ford’s are my favorite because you can slide your gear right in without worrying about seats or connectors, or anything getting in the way. My husband loved the F-150 Lariat as much as I did. It is now at the very top of our short list of trucks we’ll look at buying in a year or two! It’s a perfect combination of Texas tough, sporty, practical, and comfort.